Experiments with highly toxic pharmaceutical drugs on orphans in New York - exposed first by Liam Scheff in an article titled The House That AIDS Built - are still, after more than three years, the subject of heated discussion, specially since the BBC aired a documentary titled Guinea Pig Kids. 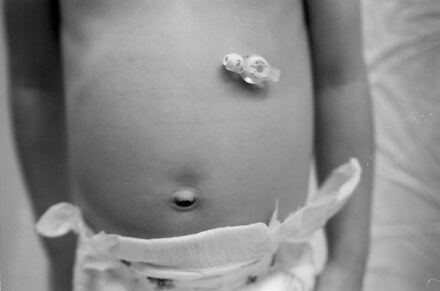 Children refusing medication were surgically implanted a tube to allow direct injection of drugs into the stomach - Image: Pediatrics. There are those who say the exposé was really a covert attempt to argue that HIV does not cause AIDS. Not really the truth but then, the media does not bend to truth - it bends to pressure. And pressure there was. In January this year, a campaign by a group of AIDS activists who push the final solution of toxic chemo drugs for those unfortunate enough to test positive for a stressed protein fraction, bore down on the editorial offices of the BBC. The arguments were hard and heavy - any questioning of the orthodox (HIV=AIDS=DEATH) view was compared to denying the holocaust that hit the Jewish community during the Second World War. The word denialist was invented by the scheming cabal to describe those who have - often legitimate - questions about the association of HIV, AIDS and certain death in an obvious effort to associate them with the rascals of the day - the deniers of the holocaust. Although the arguments missed the point - the documentary simply told of the plight of Incarnation's human guinea pigs - the BBC fell for the hard talk and caved, asking forgiveness for having aired their documentary on the drug experiments in the Children's home. Aidstruth, the group which set their sights on wiping out any opposition to the current dogma on AIDS, is jubilant. One of the major figures in the Aidstruth camp is John P. Moore, associated with Weill Medical College of Cornell University in New York City. Moore is quite clear regarding the agenda of his group. He says they want nothing less than destroy - perhaps the equivalent of 'wipe off the map'? - the "denialists" who are causing so many problems to the pharma-drug based AIDS orthodoxy. First, there is no “Aids denialist movement.” This is a term Moore has invented to describe those have pointed to the massive, blood-soaked failures of the standard Aids belief system, and pleaded for a new plan of attack on the many problems that “Aids” represents and stands in for. Second, the profit motive belongs, solely, to the mainstream. Nobody is getting rich by asking GlaxoSmithKline, Abbott, Pfizer, Boehringer Ingelheim, or Bristol-Myers-Squibb to stop poisoning poor, Black children with their very profitable, internationally distributed and hawked drugs. Moore, the “scientist” we’re supposed to trust, runs hard-core “campaigns” against those who would like to challenge a failing medical paradigm in public debate. The AidsTruth “strategy” – Writing an endless stream of letters and press-releases to newspapers, to Deans and department heads of universities, to broadcast news agenices, slandering and libeling any and all professors, doctors, scientists, journalists, researchers, patients and private citizens who cite the ten thousand contradictions in the Aids paradigm, and who are asking – begging – for an opening up of the paradigm for reconsideration. Moore says that “Aidstruth” doesn’t libel. But that’s all they do, because they won’t debate. They excuse themselves from their responsibility to face those they indict. They run like the cowards they are. (Ask them to debate anyone of the people they libel; we’ll arrange it the moment they find the cajones). They don’t libel, but the word “Denialist” constitutes libel. Equating someone who points to the ten thousand published flaws in a dangerous medical paradigm, with someone who denies the Nazi state’s murder of millions in death camps, is a profound, and intentional, libel. Its intention is to terrify anyone and everyone from looking at the statements or research of those they denigrate, for fear of being labeled a “denialist”, too, in newspapers, press releases, and on the web. They don’t threaten, says Moore, but “Destroying the leadership” constitutes a threat, when it is enacted by letter-writing smear campaigns against academics and researchers at Universities, who lose their jobs or their academic and intellectual freedom to challenge dangerous paradigms and to alert the public to flaws in policy. “I have no comment to make on the person/people you refer to, as I don’t know enough about their personal histories, and I don’t offer SPECIFIC medical advice to SPECIFIC individuals in any case as I’m not a physician. In general terms, the best medical centers and physicians would surely be able to help this person/people find a suitable therapeutic regimen. This is the same John P. Moore who claims that orphaned children should, nay, MUST be used in government/pharmaceutical drug trials, with three, four, five, six, seven drugs – FDA Black-Box labeled drugs (those that have permanently damaged or killed patients taking them) – at once. That sounds like specific medical “advice” given to a great many specific individuals. But, “in any case,” he says, “I’m not a physician.” (But that’s alright, most physicians aren’t physicians these days, either). And here is where the record skips. Aids is a name for a thousand kinds of deficiency or excess – wasting or cancer – that occurs in a thousand different environments on earth, for a thousand different reasons. “HIV testing” is a non-specific art, which moves certain groups of people into the Aids drug line. “Hiv infection,” doesn’t necessarily lead to immune deficiency, says John P. Moore. And so it is. But that’s not how it goes in the case of the crack-orphans in the Incarnation Children’s Center in Washington Heights. It is not variable, it is not questionable, it is only good for one thing. Moore and his co-BBC-killer Jeanne Bergman, have decided that all of these children must be “allowed” (forced) to take these “life-saving medications” (that’s FDA Black Box-labeled drugs, to you and me), regardless of their actual health, actual illness, actual response to being on 7 drugs at once, or to any one of the many Aids drug that cause anemia, bone-marrow death, deformity, permanent cellular damage, and then death. Probably. Or maybe not. So, “hiv causes aids?”, I guess, is the slogan. HAART is an acronym for the many drugs plied into Aids patients – these of the Black-Box label, the organ failure, skin death, developmental damage, wasting, fat redistribution, and fatal anemia. So, the “appropriate time” for these drugs is when? The answer? When John P. Moore and Jeanne Bergman say so. Which is now, immediately, and forever (till death do you part), if you’re an infant in an crack orphanage. And then, we should study what happens when we give the drugs to you, seven at a time, force-fed, , by the helpful doctors who don’t want you to miss a dose. Well, of course it is. It isn’t just a “remotely controversial issue.” It is an acutely controversial issue, especially in serious medical circles, and it has been for 25 years. Moore isn’t bright enough, or is too corrupt to allow debate on the subject, even within his own party. (If Moore actually read Aids research, from field physicians and researchers, he’d have to call half of them “denialists” for contradicting his central dogma). Moore is a true-believer. He refuses to allow a contradictory thought to enter – not his, but Your head. Otherwise, he’d allow debate, and he’d have no fear of public response to the ten thousand failures of his central dogma. He’s just got to scrub the idea of the scientific process from his mind, (and yours too), and he does so by likening anyone who has a brighter idea, to… are you ready? Not clever, but criminal. Moore, Bergman, and their group, are ruining medicine, ruining scientific discourse and medical discovery, and they must be opposed, and they must be challenged; and competition in the field must be allowed to flourish, so that the best ideas are born out, by process. Not by cabal, or attack, or slander, or censorship. But by competition in the field, which currently takes a “denialist” position to anyone who doesn’t uphold the party line. Long live competition, and choice; and today especially, may they be born again in science and medicine. An ongoing investigation by the Vera Institute of Justice, has uncovered 59 additional New York City foster care children--between July and September--who may have been used in AIDS drug / vaccine trials in violation of federal regulations. This brings the tentative total number of mostly minority children involved, to 773. The cost in the war against AIDS has now surpassed the financial investment committed to cardiovascular diseases and diverse cancers. While the science supporting the causes of heart disease and many cancers are relatively conclusive within the medical research community, the etiology of AIDS remains questionable. Simultaneously, a safe cure is no closer in sight today than it was when the disease first burst on the scene three decades ago. Yet the perception of a global AIDS epidemic looms in the minds of the media, medical associations and government leaders. Today there is a rapidly growing body of physicians, medical researchers, virologists, journalists and activists who are starting to voice their opposition to the prevailing scientific paradigm of AIDS and who are calling for a reevaluation of the medical research, epidemiological evidence, diagnostic methodologies and treatments. These voices-now numbering over 5,000, including a couple Nobel Prize laureates-have been virtually shunned by the medical academies and major peer-reviewed publications. Wonderful article Sepp. Everyone must read this. It is a disgrace that 25 years on there is still so much misinformation, lies and dodgy dealings related to the whole AIDS question. This latest episode with the Guinea Pig Kids documentary dropped like a hot potato by the BBC after receiving pressure from AIDS Truth lot, shows once again the terrible corrupt dealings that make the AIDS machine run, and the human fuel it needs and uses to keep going. Yet another horror story about the over-medicating of foster kids. In February, 2006, Florida\'s Agency for Health Care Administration announced a contract with the University of South Florida to study the use of antipsychotics on children in Florida\'s Medicaid system. Antipsychotics are easily the most destructive chemicals used on the human brain. These substances were originally marketed as a \"lobotomy in a bottle\". It is outrageous that more than 50 of these meds are used off label on children who are wards of the State of Florida.. The press release says that in 2005, close to 18,000 children were prescribed antipsychotics and more than 475,000 prescriptions for antipsychotic drugs were written in the past 5 years. This long awaited report was released last week. Allen Jones passed this news along to me. For the past few years, we have been following the Strayhorn investigation in Texas where more than half the foster children getting antipsychotics had no psychiatric diagnosis whatsoever. These were just \"bad kids\". The kids in Florida all have \"labels\". It is unclear from this report just who validated these diagnoses. A psychiatrist? A psychologist? A school official? A bureaucrat in the foster kid system? Or somebody\'s hair dresser. Armchair psychiatric labeling has become a cottage industry in this country. I suspect the majority of these \"labels\" are ad hoc in nature. A) Defense of Unethical Medical Experimentation. In addition, this letter is a demand for an open academic debate in a public forum on the merits of Moore\'s views versus the scientific views of the highly regarded academic individuals singled out on Moore\'s web site. Moore\'s activities represent an affront to academic freedom, ethics in human medical experimentation, and human decency. I appeal to you to take the appropriate action. WASHINGTON (AP) - \"The government has concluded at least some AIDS drug experiments involving foster children violated federal rules designed to ensure vulnerable youths were protected from the risks of medical research. \"
\"The U.S. Department of Health and Human Services\' Office of Human Research Protections concluded that Columbia University Presbyterian Medical Center in New York, where several foster children were enrolled in drug studies in the 1990s, failed to obtain and evaluate whether it had proper consent, information and safeguards for the foster kids.\"
(2) \'Serious concern\' at BBC over flawed HIV film Leigh Holmwood Media Guardian Tuesday October 23 2007. Far from being flawed, the film accurately portrayed ethics violations in the unlawful medical experimentation on black and hispanic orphans without informed consent at ICC. (3) see aidstruth.org which mentions a number of Moore\'s opponents by name along with defamatory labels and smear tactics. I think the following statement sums up what the "aidstruth" cabal is all about. This is an email from John Moore to Michael Geiger of HEAL San Diego. Thanks Geiger! What you sent contains useful information we can use against you people! And we will! "If they are able to "justify" their actions, it\'s most likely because they simply see this as WAR. War against the "denialists". Nothing more. When you're in a war, there are no rules." This IS a war, there ARE no rules, and we WILL crush you, one at a time, completely and utterly (at least the more influential ones; foot-soldiers like you aren\'t worth bothering with). An open letter to Cornell University. These are prophetic, powerful words about a world-class criminal cabal and one of its prominent leaders. The fact remains that these trials were conducted illegally. Children were used unlawfully as they were not appointed an advocate. If the trial data from ICC is verifiable they were not given the best medicine available as they were dosed at two to three times the safe dose for adults . Children under the age of 12 months should never be subjected to trials for HIV meds even based on the mainstream belief on HIV pathogenicity as they cannot test positive anyway.i agree the test is not a justification for subjecting children to toxic anti retro virals as it is non specific. it should not be necessary to subject any child to the kind of potencies being used in human trials - for any illness perceived illness or disease. it is state sanctioned child abuse of the most vulnerable. as a hiv positive mother i could not conceive of giving medications like Sustiva Nevirapine or AZT to a child or a pregnant woman or an unborn baby. but it seems that the great aids conglomerate can sanitise and whitewash all forms of research in the name of public health security and saving lives.. dubious claims not backed up by reality. An article in the August edition of The Lancet stated that the newest HIV Drugs -HAART- are no more effective at reducing mortality than they were 10 years ago - not what we are led to believe. And perhaps that is because HIV is as that old theory goes just a harmless passenger virus , and AIDS is really about co factors and only about the co factors . In this scenario surely gentler systems of immune boosting and therapy would be more appropriate for weakened immune systems and not toxic chemicals with a very short history of application. im haart free as of this year . i dont know yet what the implications will be im tracking myself , it hasnt been easy but my conscience will feel a lot lighter as i really do not wish to be associated with the regime that the pharmaceutical industry has become . well done with your attempts to highlight some of the concerns some of us have. I cant believe what they are doing to these poor little kids and babies at that. Its insain. Im only 14 years old but I really care about this situation and it crazy. There killing both of my races and I dont approve of it!! Blacks and Latinos are ppl too and its not fair!!!!!!!!!!!!!!!!!!! !